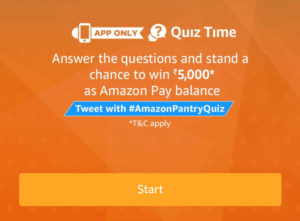 1 Amazon Pantry Quiz Answers Today & Win Rs 5000? 2.1 Q1) Amazon Pantry offers discounts and extra cashback on purchase of ________. Fill in the blanks. 2.3 Q2) Mr. X plans to shop on Amazon Pantry for his monthly requirements. Which of the following items can Mr. X not purchase on Pantry? 2.5 Q3) Amazon Pantry offers free shipping to customers on Pantry orders above what amount? 2.7 Q4) When does Amazon Pantry run extra cashback offer? 2.9 Q5) Prime customers who make a purchase of Rs 1000 or more on Amazon Pantry receive an extra cashback. What is the maximum cashback one can avail? Once again, Amazon is back with its Pantry Quiz. In this quiz, Amazon is asking question on the Pantry offers and products. You have to answer 5 simple questions to win Rs 5000 amazon balance. Amazon Pantry is an online supermarket wherein customers can buy grocery and household items. You can fill a virtual box of items from the Amazon Pantry store and have the items delivered the next day to your doorstep. The delivery charge is Rs 30 for Prime customers and Rs 59 for non-Prime customers. However, if your Pantry order value is above Rs 599, the delivery is FREE. 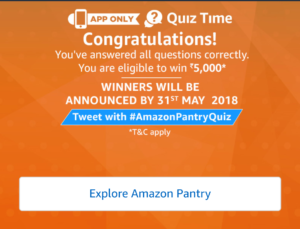 So, just check this post to get all information on Amazon Pantry Quiz Answers. You can use Amazon Pantry Cashback for shopping at Amazon.in, Recharge and payment at other merchants. Amazon Pantry is currently present in Ambala, Bangalore, Chandigarh, Chennai, Dehradun, Delhi, Dharmapuri, Faridabad, Ghaziabad, Gurgaon, Howrah, Hyderabad, Jaipur, Kanchipuram, Kolkata, Mangalore, Manipal, Mohali, Mumbai, Mysore, Nashik, Noida, Panchkula, Panipat, Pondicherry, Pune, Rohtak, Secunderabad, Sonepat, Thane, Tumkur, Vellore, Vijayawada and Warangal. They also give great offers on Amazon Pantry Products. So, check all the answers of the Amazon Pantry Quiz. 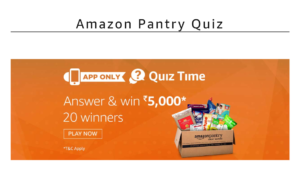 Amazon Pantry Quiz Answers Today & Win Rs 5000? 2. 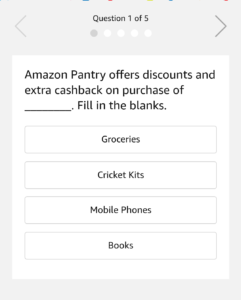 Open the app and you will see a banner about the Amazon Pantry Quiz Today Answers April answer. Click on it. Q1) Amazon Pantry offers discounts and extra cashback on purchase of ________. Fill in the blanks. Q2) Mr. X plans to shop on Amazon Pantry for his monthly requirements. Which of the following items can Mr. X not purchase on Pantry? Q3) Amazon Pantry offers free shipping to customers on Pantry orders above what amount? Q4) When does Amazon Pantry run extra cashback offer? Q5) Prime customers who make a purchase of Rs 1000 or more on Amazon Pantry receive an extra cashback. What is the maximum cashback one can avail? 1. This Contest will commence on 5th April from 12:00:01 a.m. to 20th May December 11:59:00 p.m.
5. The draw of lots will be carried out during the Contest Period for the questions and a total of 20 (Twenty) participants will be selected as winners by a random draw of lots on the first day. 6. The declared winner(s) will be eligible to win Rs.5000 (hereinafter referred to as “Prize(s)”), which will reflect in the winner’s Amazon.in account as Amazon Pay Balance.